It is autumn, the leaves are falling and the sun stands low on the horizon. A great time with intensive colours, moody weather and the air feels heavier. Its time to wrap up and look back at the rest of a year that has passed. Wh not going back to spring with a similarly low sun and as intense colours but with a fresh and light tone to it. Spring the time of waking and refreshing is also the time of shows and fairs. 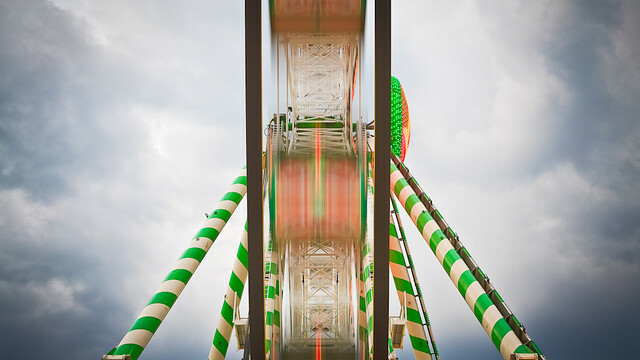 Christoph Kalck has created a stunning timeLapse film with the title Rummel, documenting and reinterpreting one of the very large German Spring fairs, the Stuttgarter Frühlingsfest. It is a colourful and bright showcase of a fairground, a maze of stalls and rides, shows and shops for about 1.4 million visitors. Image by Christoph Kalck / One of the movie stills. 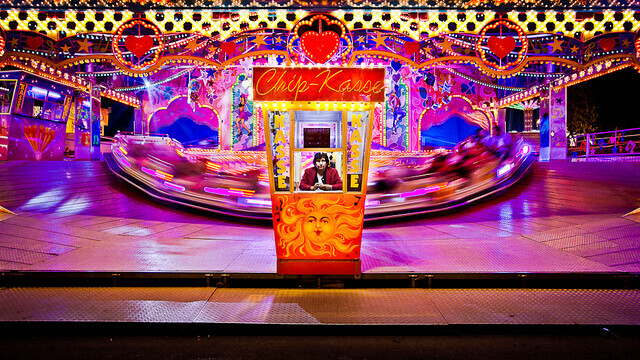 Over three days Kalck has portrayed scenes in and around the fairground capturing the rumble and zumble, the moment of surprise, the laughter and excitement. Its the joy and the fun this blinking, moving, sweet and sticky scenery conveys. He stayed on though and keept looking, he arrived early and stayed late and the movie captures it all. The setting up, the pulling of the curtain, the setting sun and the glowing, blinking and bustling lights to the dinging of the action and the moments the lights come allowing for the staff to wrap up, clean and pack. Only for it all to start again the next day. The film is by Christoph Kalck & Marcel Hampel with music and sounddesign by Sebastian Bartmann. Title was designed by Frank Rosenkränzer. The film has a facebook fan page of course. It’s the persistance and precision of the chosen scenes, the intensity of the setting and the unreal scenery that brings this clip to live and lets memories of all sorts play out on such a bright and cut autumn day. Soon it will be spring again. It may be a little late, but thanks a lot for writing so nicely, thoughtful and poetically about our work!